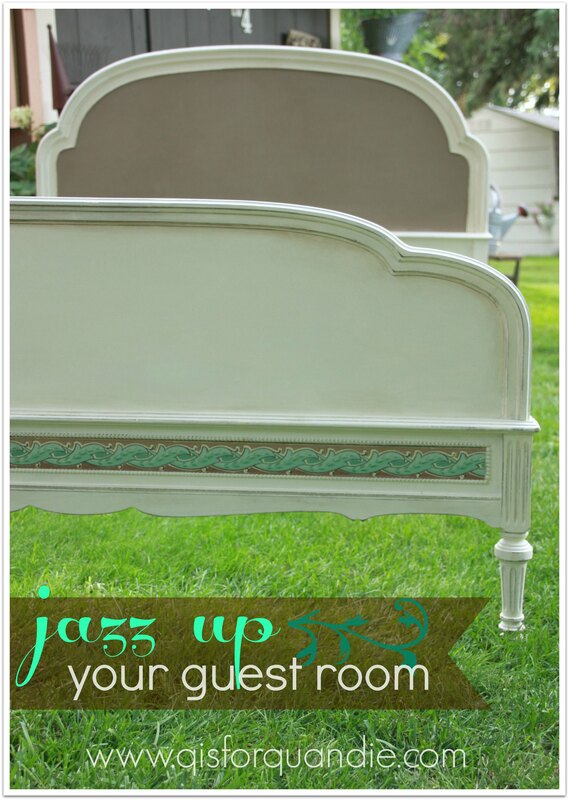 jazz up your guest room. Um, yeah, OK. I hate to turn down free furniture. Not too many people use a full size bed in the master bedroom anymore, but they are great for a small guest room. Or for a child’s bedroom. Or maybe you only have enough room for a double bed at the cabin? This would be perfect for all of the above. 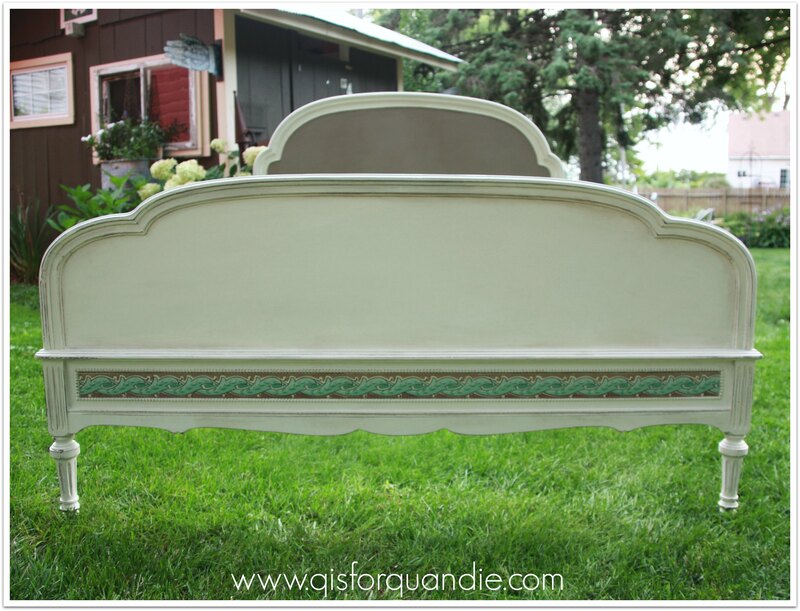 I painted the bed with Annie Sloan chalk paint, Old White and Coco. Then I added some vintage wallpaper border that I got from my friend Michelle to the foot board. 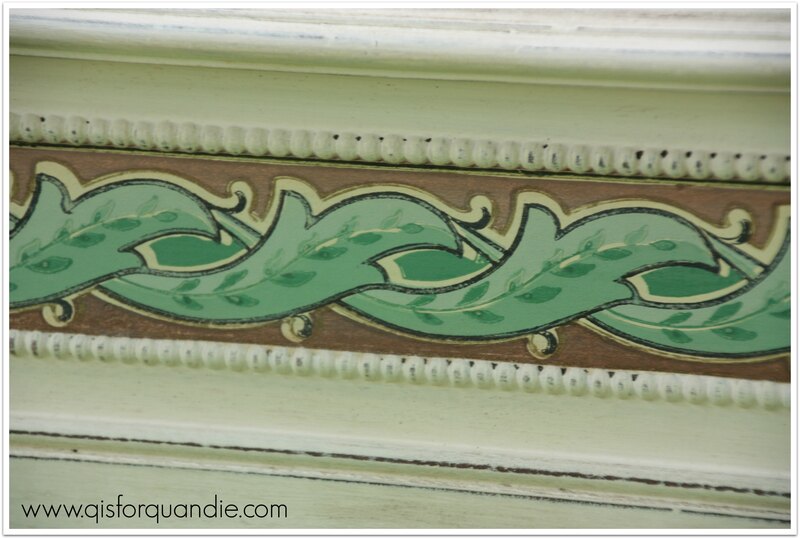 This bed has some charming details, but it’s not overly frilly. More tailored. 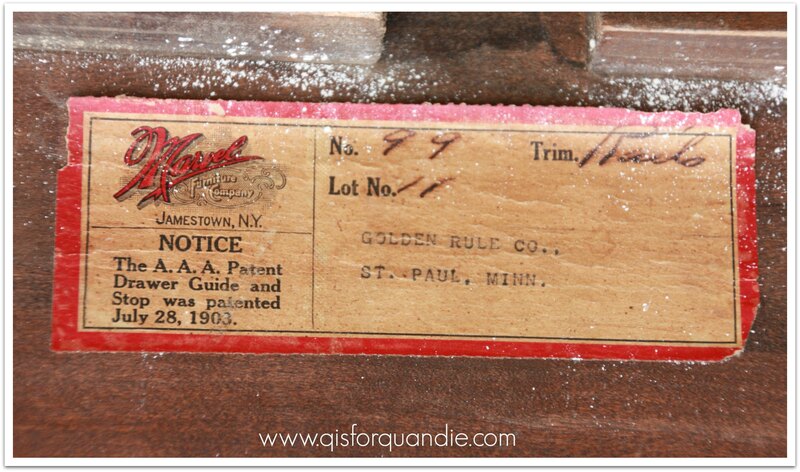 The bed retains its original label, which is kind of cool. For those of you who are local, perhaps you have heard of the Golden Rule? It was a department store in St. Paul that opened in 1886. Eventually it became Donaldson’s, which may spark memories for some locals who go back that far. The Golden Rule building still stands in St. Paul, although it has been turned into offices. It really is somewhat challenging to get interesting photos of a bed frame without a box spring, mattress and linens. 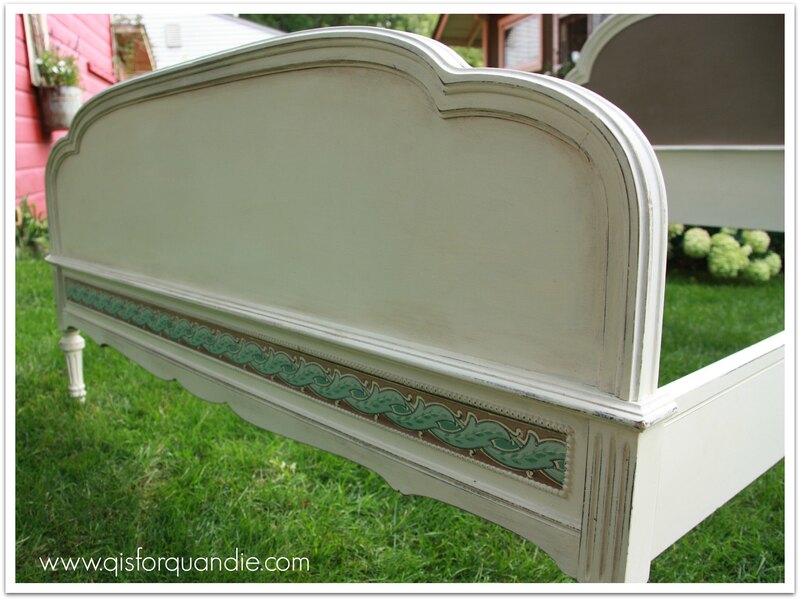 While painting this bed, I thought about how it would look fully made. With pillows in front of the headboard, a good bit of the Coco will be covered up. 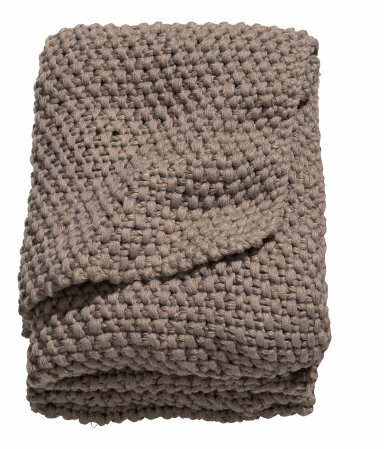 I think this bed would be gorgeous with crisp white vintage linens and then a pop of the Coco color with this throw from H & M.
But since I don’t have a spare box spring and mattress handy for a photo shoot, you’ll just have to use your imagination. Next lake of the isles. The bed is gorgeous, and I love the detail with the wall paper. 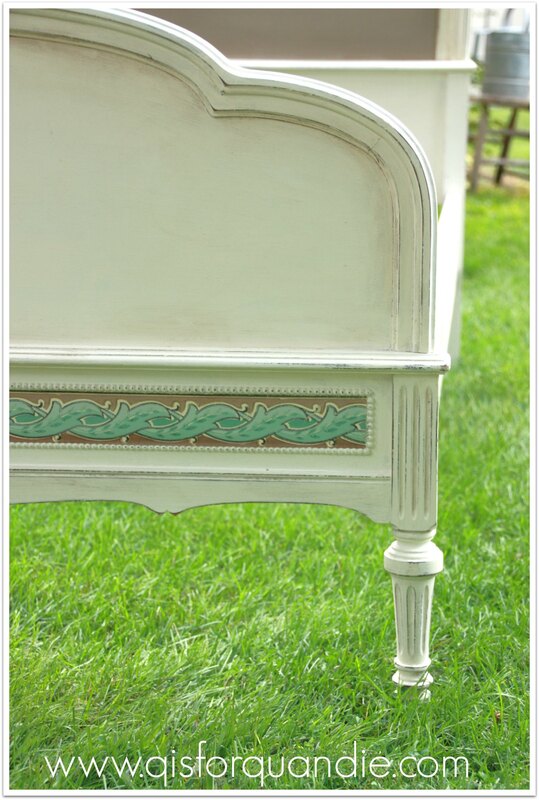 As a newbie to all of the painting of furniture can you please tell me how you applied the wall paper to the bed, what did you use and how did you seal it? I really like that idea and would like to try it on something. Thank you for sharing your great works. Thanks Debbie! I just use wallpaper paste from Home Depot that you mix with water yourself. That way I can just mix a small amount. I am careful to get paste to all of the edges. I have found that if you let it cure for a day or two, it is pretty well stuck. I am even able to sand the edges without the paper lifting off. I don’t seal it. I try to use it in areas that I don’t think will get a lot of wear. Such as on this foot board, or the fronts of drawers. I’m not sure how durable it would be in a ‘high traffic’ area such as on the top of a dresser. Who doesn’t love something free?!? I love how tailored the headboard is, the colors are great and the wallpaper gives it some pop! Great job! It is fabulous Linda! Such a fantastic way to use that border. How awesome that there was that framed in design on the bed. LOVE IT!! I know, right? And the border fit inside it perfectly. It was meant to be. Love the bed and the paper you added is genius! A completely new design idea and one that looks professional and custom-made. You’ve got two neutrals and a color pop that will make decorating the room easy for the new owner. I always have the same problem when taking photographs or displaying beds in the shop. There isn’t enough room to store a mattress and box springs on the first floor (between inventory changes). I bought an old iron bed springs last spring and I use that now because I can use it for displaying other things, also. At the same auction, I bought a big old feather bed that I thought I could use as a mattress and role up to put away when not needed. It has great old ticking on it’s cover and it is filled with chicken feathers from the farm. I hauled it around in my truck for a month, taking it to different cleaners and the price to take the feathers out, wash the ticking and put the feathers back in was around 400.00. So, I put it out in the sun every day for a month and beat it every day with a rug beater. That’s what they used to do in the old days. It is a problem to display beds in the shop. I get them set up and put some wonderful quilt or bedspread on it and then the cat sleeps on it all day. Oh….were we talking about your gorgeous new bed or was the subject me, me, me. I got on a roll there. Love the bed and what you did with it. Am I the only one who started singing Grandma’s Feather Bed in my head when I read your comment? You know, John Denver? Nine feet high and six feet wide and soft as a downy chick? Anyone? Once again you hit it out of the ball park! You are amazing! I wish I lived near you; you would have one more loyal customer!